Tired of running the same old routes? If you’re visiting Cadillac you can go out every day for a week, never run the same route twice and start each run within five miles of downtown. Probably the best known is the McKellop Walkway, a sidewalk through the parkway along Lake Cadillac. End to end it’s a mile long, an out-and-back two-miler. It’s foot traffic only, so you won’t be dodging bikes or skateboards and the lake is always in view. You’re never more than a few yards from the water. Looking for more mileage? Connect with the Clam River Greenway or continue out on the White Pine Trail. Learn more about this trail and get a map. The Clam River Greenway starts where the river flows out of Lake Cadillac. Cross Chestnut Street and stop at the musical art structures in the Sound Garden to stretch, then head north on the paved Greenway. For the next mile-and-a-half, the sidewalk follows the Clam River as it cuts through the city’s residential streets. The Greenway, lined by trees for much of its route is the perfect shady escape for runners on a hot sunny summer day. Midway through, the trail leaves the river to cross Business US 131 and circumvent a shopping center before returning to the stream. Blue painted footprints show the way through this short detour. The Greenway ends at the roundabout at the intersection of Plett Road and Thirteenth Street. Turn here and return to Lake Cadillac to complete a three-mile run. Learn more about this trailhead and get a map. The White Pine Trail is a linear State Park built on an old railroad bed that begins just north of Grand Rapids and continues 90 miles to Cadillac. Starting at the parking lot adjacent to of the Rotary Pavilion on Lake Cadillac, it’s about a quarter mile south to where the White Pine Trail begins at the corner of Holly Road and Lake Street. Popular with cyclists and walkers, the paved trail is wide enough to easily accommodate the recreational traffic. Crossing Sunnyside Drive continue on the asphalt trail and just past 41 Road, look for a painted “5K”. Turn around here and retrace your steps to complete a 3.1 mile workout or you can go to the next intersection at Hector Road where you will find a parking lot with an outhouse for a 4 mile. At this point you’re about 2 miles out from the Rotary Pavilion. Fans of the long run can continue. Wooden mileposts will help them chart their mileage.  The Cadillac Heritage Trail begins just east of the Carl T. Johnson Hunting and Fishing Center. The basic loop is 2 ¼ miles but doubling back and repeating loops will make this a longer run. Much of it passes through wetlands spanned by boardwalks. Beaver, muskrat, deer, and a variety of birds inhabit the area making it a popular choice for nature lovers. By taking the connecting path to Kenwood Park, runners will discover one to two miles of additional loops and paths. Usually when one follows a road around a lake, the water is obscured by a layer of cottages. That’s not true if you’re following the 7.1 mile Lake Cadillac Bike Path where more than half of this circuit provides a lake view. There’s ample parking at lots along the McKellop Walkway and in Kenwood Park as well as bathrooms at both locations. This where serious runners do their training for long distance events. It’s 10.5 miles around Lake Mitchell. Add a lap around Lake Cadillac and you have a figure eight run totaling 17.6 miles. If you like long runs or are training for marathons or 25ks, this is a circuit you could love. One of the top master runners in the state, Hank Risley, a former Michigan Runner Magazine “Runner of the Year” and his wife Cathy, also an accomplished competitor, rate this as their favorite long run. To bump it up to 20-miles add a loop around Mitchell State Park Campground, a tour through Hemlock National Forest Campground plus the out-and-back to the end of the Camp Torenta Road (South Lake Drive). In planning this route, Hank encourages runners to check out the wind direction. You’ll want to avoid a headwind on the 2.8 mile straight-away down Pole Road along the south side of Lake Mitchell. 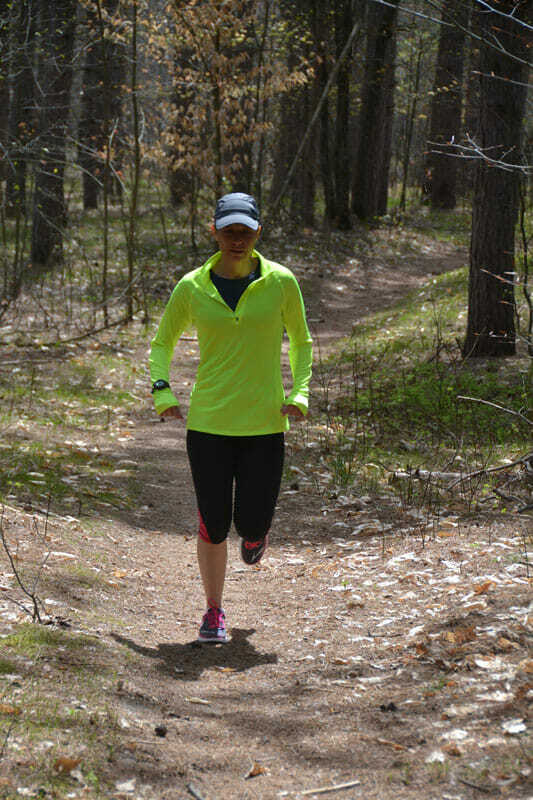 The DNR Cadillac Pathway has a reputation as one of the best cross country trails in the Lower Peninsula. When the snow’s gone, cyclists on fatbikes and mountain bikes, as well as walkers, and runners take over the pathway which takes visitors through hardwood and conifer forest. The Cadillac High School cross country team works out there on a regular basis in the summer. The trail has more than 12 miles of well-marked pathway with loops ranging from 1.5 to 10.5 miles. The northern trailhead located off Seeley Road near the east of end of Boon Road (34 Road) has ample parking and an outhouse. This end has more level terrain. The south end of the Pathway begins at the east end of Thirteenth Street (East entrance to the Wexford-Missaukee Intermediate School District). Parking is limited and there are no bathroom facilities. With a good number of hills, this is the more challenging section of the trail. To maximize the uphills, run the loop counterclockwise. 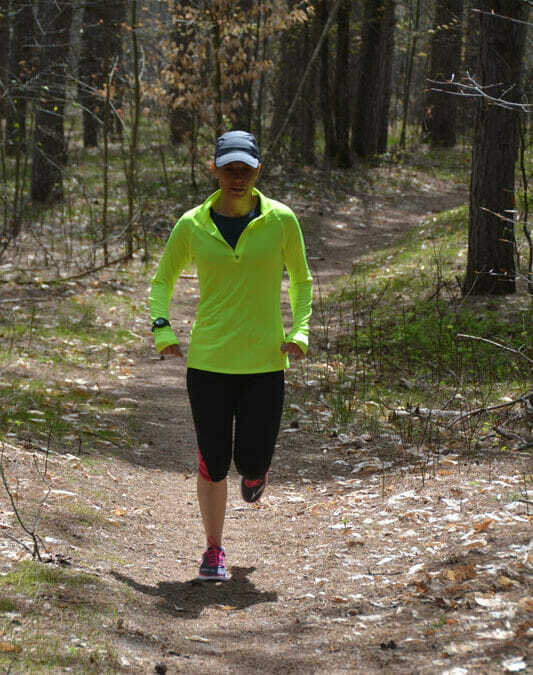 Looking for more running adventures? There’s miles of Manistee National Forest Trails and country roads to explore just beyond the city limits. Check out the Fall Color Tour Routes, and be a weekend warrior!